Special Transportation Services has been a part of UMass Transit Service since 1986. 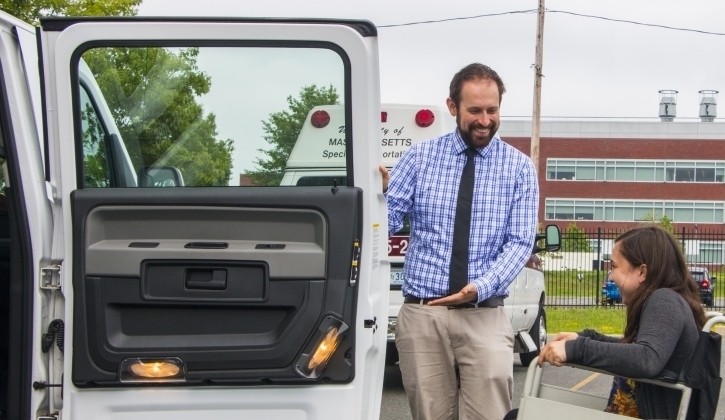 "SpecTrans" provides free transportation service around the UMass Amherst campus to students, staff, and faculty with a disability. Special Transportation Services provides an on-call and reservation service for passengers with both temporary and permanent disabilities both on and off campus. Our primary mission is to transport people to and from their classes and work. We also provide off campus trips on a limited basis. Vans are equipped to carry the majority of wheelchairs. UMass students, staff and faculty who need our service on a long-term basis must register with Disability Services by calling (413) 545-0892. Passengers with temporary disabilities can register directly with the SpecTrans Dispatcher. For further questions, to register, and to schedule rides contact the Special Transportation dispatcher at (413) 545 - 2086. Five-Colleges Incorporated will fund trips between UMass, Hampshire College, Amherst College, Mount Holyoke College, and Smith College for some academic programs. These trips are scheduled through the UMass Transit Field Trip Service. Inquiries should be directed to Diana Noble at least one week in advance.